A regular engine tune up is a vital part of necessary vehicle maintenance and should only be performed by qualified professionals with the correct industry-specific tools and diagnostic systems. A visual inspection of the engine’s fuel-system components looking to make sure the fuel filter is clean and clog-free, that a clogged filter hasn’t caused any damage to the fuel pump, and that the fuel injectors are free of deposits and other grime. A visual inspection of the spark plugs to gauge their age and wear. A check of spark plug performance to make sure they are functioning properly. A check and adjustment of the ignition timing and idle if needed. A check of the engine’s PCV valve. A check of the vehicle’s engine air filter and cabin air filter. A check of the oil and coolant levels. 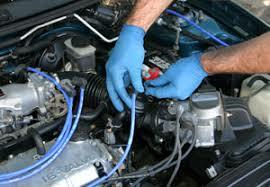 It is important to have an engine tune-up performed on your vehicle on a regular basis. How often this should be done depends on the condition of your vehicle as well as the make, model, and mileage. Feel free to consult with one of our engine technicians regarding the specifics of your vehicle.